The ThingMaker line of toys made its long-awaited debut in 1963, which is a huge milestone by all standards. However, the pioneer is more renowned for being a trendsetter when it comes to innovation and technology. A lot has certainly changed since then, considering that the original version of the Thing Maker actually used die-cast molds to make bugs, dragons or even plants. The downside was that the procedure was quite daunting, where you had to pour a special type of plastic, and prior to baking the molded rubber shapes in the oven for them to form completely. Fortunately, the latest version of the Thing Maker 3D printer is more convenient and very user-friendly. To put this into perspective, let’s have a closer look at the latest Thing Maker 3D printer, by Mattel. What better way to tap into your children’s creativity than invest in a machine that enables them to design and create their own toys, in a simplistic fashion. With the touch of a few buttons, you can design even the most sophisticated models and in 3D. On the surface, the printer is not only aesthetically pleasing but also looks really simplistic. It comes with a number of safety features such as the modified printer door lock system. Moreover, it comes with a simplified color filling “filament system” More importantly, though, is the fact that it comes with an equally simplistic app that allows the user to conveniently design, modify, customize and print models on their iOS or Android devices. The ThingMaker design app is just pretty darn effective to bluntly put and this can be attributed to the fact that the app’s creator is Autodesk – one of the most accomplished in the niche. By just flicking through the menu options, it instantly becomes apparent that you are in for quite a ride. For instance, it allows you to import varying parts of the design model, from the menu for later modification applications. True to this, the imported parts can be adjusted in color, size, and texture to match the comprehensive model. The ThingMaker 3D Printer is not one of those selfish models that limit you to the inbuilt hardware. In fact, you have a wide range of printing options with this one-a-kind printer. For instance, you can choose to export your models as images directly to Google Drive or Dropbox. Not convenient enough for you? Well, you can also opt to export your files as STL, and thereafter, print from the machine of your choice. If you are looking out for a “do-it-all” versatile 3D printer, your safest bet certainly lies in the ThingMaker and for a number of good reasons.For starters, it delivers quality 3D designs in varying colors, including glow-in-the-dark models. 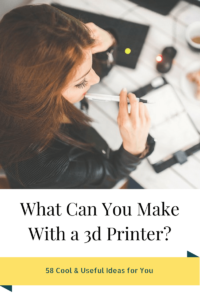 Besides this, the highly-effective printer can produce 3D designs of different plastic densities; some soft or hard based on your personal preferences. This is without mentioning the fact that it can deliver colorful models, which change colors in sunlight. Indeed, it is the first 3D printer that actually stands a chance of going mainstream. Given, there is a defined market for such printers; just not at home. A good number of companies mainly in the automotive, medical and aerospace niches have for a while now been investing in hefty amounts for top-notch 3D printers. This in itself, made such machines out of reach for the ordinary consumer. The ThingMaker printer, though, seeks to change all this by offering a simplistic, robust and more importantly, affordable 3D printer, ideal for home use. Some will classify it as just a mere toy, which is good at designing and producing models or jewelry with ease. However, it is certainly more than this going by the amazing features incorporated in the innovative design. The only downside with the ThingMaker is the fact that it isn’t what you would call an “enterprise-oriented” printer. In short, this is not the ideal printer to place in your office, even though it can effectively perform to the desired standards. Its comprehensive exterior design adopts a somewhat “toyish” look and hence, not specifically crafted for office use. To sum it up, the ThingMaker 3D printer is indeed a game changer by all standards. The truth of the matter is that this printer perfectly bridges the gap between toys and the real deal. You also get to learn a thing or two in the process and while at it tap into the true potential of your child’s creativity. At only $300 (as of the date of this reviw), what else could you surely ask for? This 3D printer is currently available for pre-order and will be delivered in the month of October, 2016 if you place an order now. [Update February 22, 2017] As on this date, the product is not available at Amazon and there is no specific date mentioned for new orders. Click here check the current price and availability at Amazon.